After three bloody years of waiting, Maze Runner: The Death Cure (2018) is finally out. I know it’s not the filmmakers’ fault that the film was delayed for a couple of years. Dylan O’Brien, who played Thomas, a.k.a. the main lead character was injured. I heard the injury was so severe and therefore the film shooting must be postponed. Luckily, he was alright now and Maze Runner: The Death Cure is finally out. I didn’t expect much from this film since I have read some spoiler of the book, and therefore I kind of knew what happened to certain characters—which I hope would not be true in the film. Unfortunately, that’s not the case and I’m pretty sad about it. Before we jumped any further about the story, let’s talk about the actors and the actresses first. I won’t discuss them one by one since all of them did a very good job of portraying their characters. The character Minho wasn’t really highlighted like during the first two films. He was still great in The Death Cure but his role wasn’t as huge as before. Minho was everyone’s favourite back in The Maze Runner (2012). However, even though I like Minho, my favourite character is Newt. Ever since I saw him in The Maze Runner, I like him better than Minho. Newt was played by Thomas Brodie-Sangster, who used to play the character of Simon in Nanny McPhee (2005) and Jojen Reed in Game of Thrones. Although I can’t say he is one of my favourite actors, I do like him as an actor. However, I don’t like Newt just because only the actor who played the character but also because of Newt’s personality. It seems like through time, everyone also likes Newt in The Maze Runner Trilogy. He’s loyal, smart, and kind. Plus, the character was portrayed by Thomas Brodie-Sangster. I think that’s also the main reason why the character of Newt was liked by so many people. Thomas Brodie-Sangster played the character of Newt really well. The character really suited him and I could not imagine another actor play the role. I am sure Thomas Brodie-Sangster can play the character of Thomas well but I think he better suited as Newt. Dylan O’Brien was already doing great in portraying the character of Thomas. Of course, Kaya Scodelario also did good in portraying Theresa. Although nobody stated which character from which country, we all knew from the accent that Newt must be British and Theresa must be American. Kaya Scodelario is, in fact, British and she did her American accent really well. At least from common ears like mine, her accent is good. Personally, I don’t really like Theresa’s character and personality but somehow, I like how the scriptwriters were able to show us a different point of view from Theresa’s side. She desperately wanted to find a cure. Although I can’t justify her way of finding the cure, at least I got why she desperately wanted to find it. I would like to see more of Thomas and Theresa but since The Death Cure is not a romance film, I don’t mind the lack of interaction between them. However, it still nice to see how both characters interacted with each other. Dylan O’Brien and Kaya Scodelario were able to show a little bit of chemistry between their characters. I was a bit disappointed when the appearance of Minho, portrayed by Ki Hong Lee, is much less than the previous two films. He used to be the starlight, especially in the first film. I can still remember how people talked about him more than Thomas who was supposed to be the main character. However, I was glad that Newt’s appearance is more than before since I really like Newt better than Minho. In terms of story, I think The Maze Runner still holds the best storyline. The second instalment of this franchise, a.k.a. 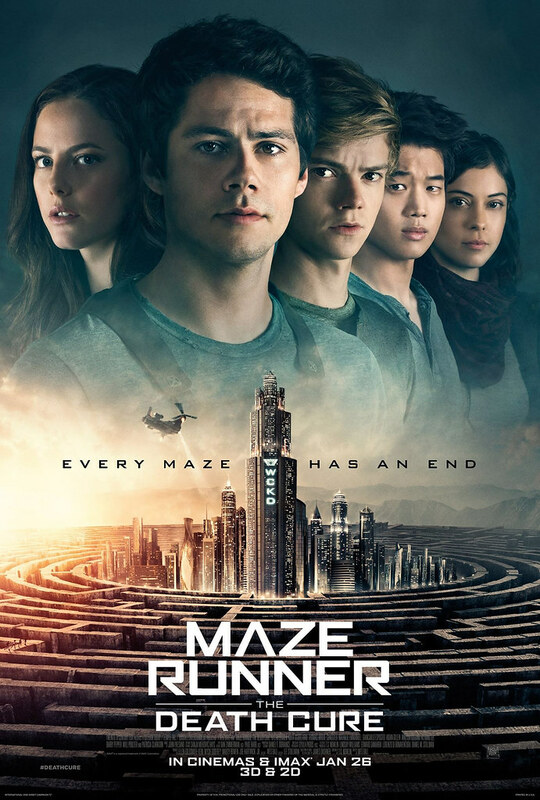 Maze Runner: The Scorch Trials (2015) got me very disappointed but luckily that’s not the case in The Death Cure. If The Scorch Trials made me very very disappointed, The Death Cure at least made me less disappointed than before. I kind of know what would happen in this film and therefore I was less disappointed than most people. Still, I was expecting something different since they changed so much for the second film and I was hoping they made changes in the third film as well. By changes, I meant the story that the filmmakers knew would make the viewers disappointed. I never really like dystopian films because, at the end of the day, the ending would never satisfying. From The Hunger Games franchise, Divergent series, to The Giver (2014) or Ender’s Games (2013) and so on, none has become really my favourite. It’s always the ending that troubles me because they had a disappointing ending or they left the story hanging. I can say the same with The Death Cure. Not only the ending is disappointing, it kind of left us the feeling of hanging. Did I feel The Death Cure is better than The Scorch Trials? Yes. But did I really like The Death Cure? Not a chance. Since The Death Cure took a long gap after the first two films, I kind of forgot some of the stories. It became unclear whether W.C.K.D is indeed wicked or good because they didn’t quite tell it clearly. Like the character of Janson who seemed to be good but later on wasn’t. It’s unclear why he was wicked and cruel and why he killed people without reasons when he was supposed to help people find a cure. Aidan Gillen is indeed a great actor to play a villain. From the moment I saw him in Game of Thrones as Petyr Baelish, a.k.a. Littlefinger, I knew Aidan Gillen would do great in playing villains. His voice sounds annoying, his smirk made people want to smack his face. He really portrayed villain characters flawlessly. I wish they told us more about the character of Ava Paige, portrayed by Patricia Clarkson. To this date, I still don’t know if she’s good or bad or rather like Theresa. The CGI effect of The Death Cure is good, though I still found some flaws. However, I can overlook them because the action sequences were pretty intense, though it’s not as intense as the first instalment. The first film, The Maze Runner, is indeed far better than the sequels. I don’t know if this kind of thing has become a syndrome but from The Hunger Games to Divergent, the first instalment is always the best. The story became worse as the sequels went by. It’s disappointing, really. But seeing it has become a pattern, I wasn’t too surprised anymore or too disappointed when I found these kinds of films’ sequels were not as good as the first film. All in all Maze Runner: The Death Cure is an okay film. It’s not great, kind of disappointing but still better than Maze Runner: The Scorch Trials. All the cast have done their job really well, even though the story is disappointing. I give Maze Runner: The Death Cure 7 out of 10 stars.